LOUISVILLE, Ky. (Feb. 7, 2018) — The Secretariat Team announced today that Charlie Davis, the charismatic exercise rider for 1973 Triple Crown winner Secretariat, died early this morning from complications of lung cancer. He was 78. 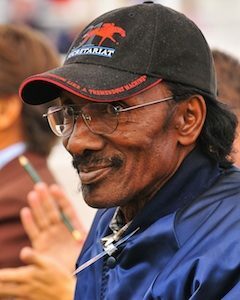 Davis, who was born on Feb. 2, 1940, in Orangeburg, S.C., started his vocation by cutting elementary school to watch the Thoroughbreds train on the farm where his father worked. Small in stature but tough and determined, Davis learned how to exercise horses and eventually went to work for legendary trainer Lucien Laurin, becoming a member of the famed “Holly Hills” crew that also included storied groom Eddie Sweat. Davis exercised some of the era’s top racing stars of the 1960s, including champion filly Quill and Belmont Stakes winner Amberoid. In 1971, when Laurin took over Christopher Chenery’s Meadow string, Davis was assigned as exercise rider for the stable’s champion colt Riva Ridge and later Secretariat. He continued exercising horses until 1981, when he was thrown and suffered a career-ending back injury. Davis later worked as a foaling manager for several farms in the Ocala, Fla., area, and was known throughout the industry as a well-rounded horseman. Ron Turcotte, the Hall of Fame jockey who rode both Riva Ridge and Secretariat, said that Davis’ passing is a great loss for the Secretariat Team and for the sport of horse racing. Davis regularly made appearances at racing venues, the Secretariat Festival and other events to the delight of generations of fans, always willing to share stories of Secretariat and his first-hand experiences as a member of the Meadow Stable Team. Following the announcement of his cancer diagnosis last month, friends and fans rallied around Davis, raising funds to cover his medical expenses. Davis is survived by his wife of 51 years, Caroline, as well as seven children and several grandchildren. His daughter, Katina Davis, said the family has been overwhelmed by the love and support they have received. Davis never missed an opportunity to brag on his champion Secretariat, whom he simply called ‘The Man,’ yet always humble about his own undeniable contributions to the colt’s legendary success and content to stand in Big Red’s massive shadow.